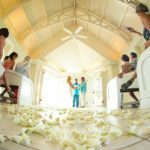 This Big Island wedding was photographed at the Kona Sheraton. The couple was married on Bayside Overlook, which is a grassy area behind the chapel overlooking the ocean. It was a cloudy day but we used off camera flash to bring light and color to the couple.